The Unison Aero Occupancy Sensor (UAOS) is a completely wireless device that works with other Unison Aero controls. The sensor has on-board photovoltaic panels that recharge the sensor using any light source in the visible spectrum. For normal operation we find the photovoltaic panels give the UAOS plenty of charge without any batery installed. However, during programming the charge can be depleted by repeatedly entering "Walk-Thru Mode." We recommend that installers carry a battery to supplement the UAOS charge ease programming. The UAOS accepts a CR2032 battery. 1) Gently remove the cover to UAOS. The white plastic cover can be separated from the base of the unit. 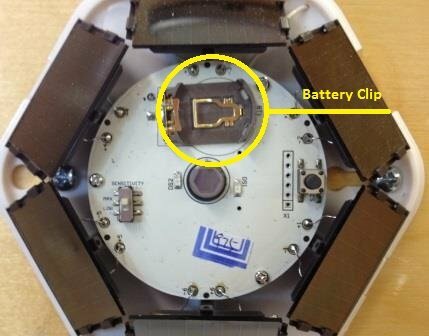 2) The battery slot with clip will be visible on the circuit board of the UAOS. Please only use a CR2032 battery with the UAOS. Note: The cover must be reinstalled for any coverage testing. 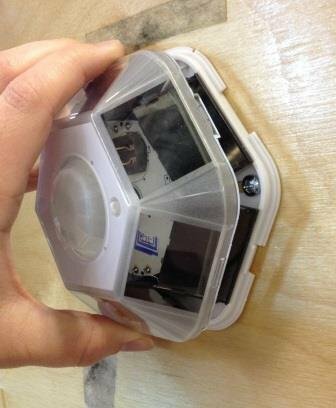 The Lens for the PIR emmiter in part of the cover. When reinstalling the cover, be sure to allign the Teach button hole with the button.